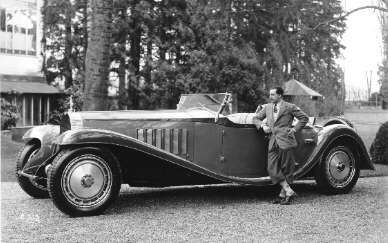 Jean Bugatti and his 1932 "Royale" built for Armand Esders. The Bugatti Type 41, better known as the Royale, is one of the most extreme luxury cars ever built. It was enormous, with a 4300 mm (169.3 in) wheelbase and 6.4 m (21 ft) overall length. It weighed approximately 3175 kg (7000 lb) and used a massive 12.7 L (12763 cc/778 in³) straight-8. Everything about the Royale was magnificent. Its cast "Roue Royale" wheels measured 610 mm (24 in) in diameter and were works of art in their own right. All six "production" Royales still exist (the prototype was sadly destroyed in an accident in 1931), and each wears a different body, some having been rebodied several times. The massive engine(apx. 4.5 ft long x 3.5 ft high), one of the largest fully-realized automobile engines ever made, produced 205 to 223 kW (275 to 300 hp). Its cylinders, bored to 125 by 130 mm, each displaced more than the entire engine of the contemporary Type 40 touring car. It was a high-tech design, as well, with 3 valves per cylinder driven by a single overhead camshaft. Nine bearings were specified for reliability, but only a single custom carburettor was needed. A derivation of the Royale engine was also used in railcars. The Royale was launched just as the world economy began to sour. Just six were built between 1929 and 1933, with just three sold to external customers. The first (chassis number 41111) to a French clothing manufacturer named Armand Esders in 1932. The second (ch no.41121), also in 1932 to a German obstetrician named Josef Fuchs. It was built to exacting standards and above its radiator grill cap perched a replica of a Rembrandt Bugatti elephant sculpture. This Royale incorporates one of Jean Bugatti's most fantastic designs. Armand Esders brought it to the U.S. and the car surfaced in a New York junkyard in 1943 and was bought and restored by a General Motors executive, who eventually gave it to the Ford Museum. The third (ch no.41131) to a wealthy English man named Cuthbert Foster, in 1933. The remaining three were kept inside the company, including one which would become the personal car of Ettore Bugatti for the remainder of his days. The unused engines were pressed into service in locomotives on the French national railways, turning the whole episode from a dismal economic failure into a great success for Ettore Bugatti during the depressive years of the 1930's. The Royale has become legendary, like the Atlantic. In 1991, Tom Monaghan, founder of Domino's Pizza, sold his Royale (ch no. 41150) for US$8,000,000, which was actually less than the £5.7 million he purchased it for. Two of the original six including Ettore Bugatti's own Royale are located at Musée National de l'Automobile de Mulhouse, as is the replica Esders Royale. Ettore Bugatti's personal car, the Type 41 Royale "Coupe Napoleon". This page was last edited on 17 August 2008, at 01:11.